Baron Palace Resort Sahl Hasheesh is a magnificent hotel situated in the heart of Sahl Hasheesh Bay on the Red Sea Coast of Egypt and faces private sandy beaches. Special offers are available on room upgrades including sumptuous Royal Suite with Private Pool. Certified Gold: Official 5-star properties that excel where their contemporaries lag with excellent reviews, usually award winning & a taste for the finer things in life. Other dates/durations available, please use our live chat service or call our friendly luxury travel experts for more details and to book. Baron Palace Resort Sahl Hasheesh is a magnificent hotel situated in the heart of Sahl Hasheesh Bay on the Red Sea Coast of Egypt, and set in landscaped gardens facing an 850m private sandy beach. With an impressive architectural design and Oriental-themed interiors of a rich and elegant décor, the Baron Palace Resort Sahl Hasheesh focuses on your total satisfaction for a superb holiday experience. Baron Palace Resort Sahl Hasheesh is a magnificent hotel situated in the heart of Sahl Hasheesh Bay on the stunning Red Sea Riviera Coast of Egypt. This is one of the best properties on the Red Sea. Multi-award-winning deluxe property with a perfect score of 5 out of 5 from Trip Advisor. Marvellously set in landscaped gardens facing an expansive 850m private sandy beach. With an impressive architectural design and Oriental-themed interiors of a rich and elegant décor. Baron Palace Resort Sahl Hasheesh focuses on your total satisfaction for a superb holiday experience. Guests can lounge by the 4 outdoor swimming pools, relax in the Spa of enjoy a game of tennis or beach volley. For the little ones there is a kids club, children playground, cinema and interactive water park with cannons and sprays. As well as 2 water slides, a giant tipping bucket and unique play-the-waves appendage. The hotel comprises 644 spacious rooms and suites. Rooms feature king size bed or twin beds, a balcony/terrace, sitting area, electronic safe. Of course, there is AC with individual control, vanity table, minibar replenished daily, dual line telephones with data port and voice mail, interactive multi-media systems. High-tech 32-inch LCD TV, sat TV with music channels, high-speed internet access, tea and coffee making facilities, iron and ironing board. For your comfort there is a pillow menu with various types of pillows upon request. As well as telephone, radio with individual wake up clock, wired or wireless internet access, key card access. In your executive bathroom with bathtub/shower stall, hairdryer, shaver outlet 220V, magnifying mirror. Deluxe Baron toiletries are replenished upon request, 100% Egyptian cotton linen, towels and bathrobes. All Suites, Baron Club Sea View Rooms and Swim Up/Private Pool Suites enjoy the unique privileges of the Baron Club. With its exclusive access to the spacious Club Lounge that offers indoor and outdoor seating, complimentary wifi connection. The perfect place to relax or mingle over cocktails and hors d’oeuvres. It serves also complimentary food and beverages; including alcoholic beverages and day long refreshments. Also an array of snacks and extensive choice of international tea selection. Guests staying at the Baron Club enjoy the privilege of Mikado Restaurant (Japanese Restaurant, all-inclusive board, adults-only). Prior reservation is required. Dining options include world class 7 a la carte restaurants varying from Egyptians, Italian, Mexican, Asian, BBQ, Sea food, Sushi Bar and Teppanyaki. Baron Palace Sahl Hasheesh features 4 swimming pools. The main infinity pool, cascade swimming pool, a relaxation ‘meditation’ pool with jets (adult-only) and kid’s pool. There is also a Jacuzzi, hairdressers and beauty salon. 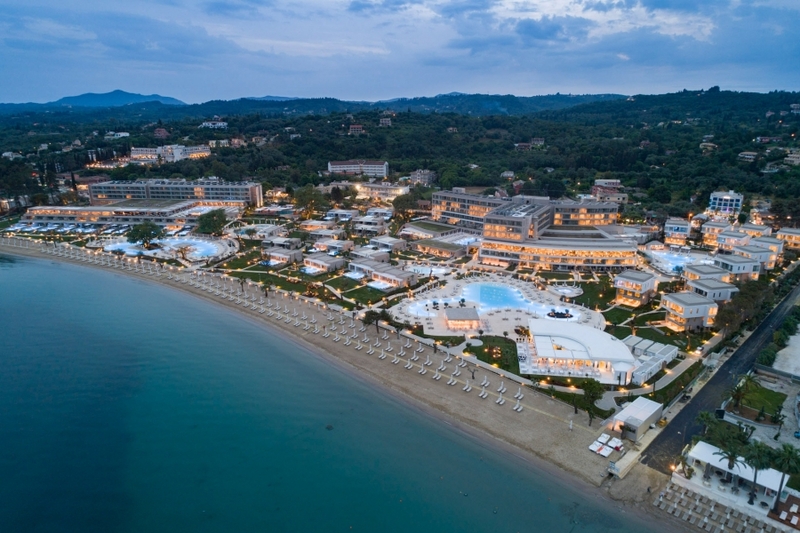 Leisure facilities include floodlit tennis courts, beach volleyball, beach aerobics/games, water polo, table tennis, pool table, darts, private jogging and cycling promenade. For the little ones there is a Kids Club ( 1-3 years, 4-7 years, 8-12 years and 13-17 years). As well as a kids playground, kids swimming pool (heated) with interactive water park, cannons and sprays. Also 2 water slides, a giant tipping bucket, unique play-the-waves appendage and create your own music. There is also a kids beach playground, indoor activity room, three cinema rooms, computer stations, sleeping room and library. The Spa offers a comprehensive selection of facial, beauty and spa services. There is a sauna, steam room, whirlpool, variety of showers, outdoor spa pool, indoor relaxation areas, massage area with 16 treatment rooms. Additionally a mud bath chamber, Turkish bath, massage service (hot stone, Thai, Balinese and Shiatsu) and juice bar. The Adam & Eve Private Couples Treatment suite (70m2) offers private room, relaxation area, sauna, whirl pool, rain shower and bathroom. Located in the hotel lobby and offers a wide array of exotic local and some imported alcoholic and non-alcoholic cocktails and spirits drinks. Choose your favourite fruits and vegetables juices or cocktails while enjoying the breath-taking and relaxing atmosphere of our stunning pool. Why not try something different and spend your time dancing on the latest hits. It is the perfect place to indulge yourself while sipping your favourite drink. Pamper yourself and experience the ultimate relaxation while sipping your favourite drink. It is an excellent place to have an aperitif drink before drink or digestive drink after a superb Italian meal. The Lounge is mainly designed to serve guests residing in the Executive Sea View rooms, Swim-Up, Junior and Royal suites. You can relax and enjoy stunning views of the sea and hotel courtyards. The lounge features complimentary Wi-Fi connection. The club lounge serves complimentary food and beverage presentations including alcoholic beverages and refreshments; an array of snacks and an extensive choice of international tea selections. Also, The Club features after-dinner liqueurs and cordials. Baron Club Rooms and Suites enjoy the following deluxe amenities and superb services: refreshed seasonal fruits, evening turn-down service, free use of sauna, steam room and Jacuzzi, feather duvet with pillow standard, luxury toiletries enriched with Dead Sea minerals. It is the perfect place to relax or mingle while sipping your favourite cocktail, snacks and alcoholic beverages. A modern classical English bar offering exclusive cocktails and premium Cuban cigars. The bar has a total of 58 seats, of which 46 seats are indoor and 12 seats are outdoor. Choose your favourite drink and make new friends at our Teenagers bar specially designed to host our young clients below the age 17 years old. A wide selection of non alcoholic drinks and tempting cocktails for you to choose from. Indulge yourself in our International open buffet restaurant with our famous cuisine with the live cooking stations. This restaurant serves breakfast, lunch and dinner. Don’t miss our daily change of themes. The restaurant has a total of 730 seats, of which 630 seats are indoor and 100 seats are outdoor. You do not have to travel to Italy to experience the true taste of pizza, pasta and antipasto. Our chef will be delighted to prepare a unique pizza with your own choice of delicious toppings. Do not miss our famous Italian starters specially designed to satisfy your taste. The restaurant has a total of 134 seats, of which 70 seats are indoor and 64 seats are outdoor. A cozy restaurant offering oriental food of the finest quality. Kill your cravings with our fresh-baked bread, Oriental appetizers and an array of mouthwatering salads. Choose a plate of specially-marinated kebab and kofta, stuffed pigeon, or even molokheya with chicken and rice. And don’t forget to try our special Eastern sweets and desserts. The restaurant has a total of 95 seats, of which 55 seats are indoor and 40 seats are outdoor. Enjoy the finest Mexican dishes in the most comfy and beautiful surrounding. Explore a wide array of Mexican specialties ranging from nachos, quesadillas, tacos, fajita and other dishes cooked to your taste. The restaurant has a total of 64 seats, of which 36 seats are indoor and 28 seats are outdoor. The casual Far Eastern ambiance and the authentic Asian Fusion cuisine prepared by our talented chef are making this outlet an experience to remember. The menu is quite diverse, but we recommend you to try any of the sizzling selection of excellent noodles, juicy chicken, marinated beef or tasty shrimps, in addition to numerous sauce toppings to add remarkable taste. Choose from a wide array of freshly seafood dishes cooked to your liking grilled, smoked, fried, and steamed. In addition to an extensive menu overflowing with our BBQ specialities. Featuring a bedroom with opulent fabrics and bespoke furniture along with a large deep-soaking bathtub (Jacuzzi), vanity area with double basin and separate shower, the suite becomes a sensory retreat. This luxurious, unique suite reflects an elegant, classic sense with a breathtaking view over Sahl Hasheesh Bay, a magnificent view of the golden sandy beach, the clear turquoise sea, the most famous reef walls with the coral slopes and the colourful water leaping your feet and triggering your emotions, turned it a perfect choice for those who are searching for luxury. The availability of your personal butler 24 hours. Private swimming pool overlooking the majestic red sea with its private bathroom, dining table for 4 persons with complimentary breakfast in the Suite and unlimited visits our high quality awarded “A La Carte” gourmet restaurants for guests on Premium All Inclusive. These 43 rooms, 45 sq.m each, offer comfort and privacy with a furnished terrace/ balcony which enhances the complete feeling of luxury. Each has two single beds each 120 cm wide. Subex Diving & Snorkelling Centre, CMAS Allstar & SSI Platinum certified, on-site fully-equipped centre offering a wide range of activities customized for all ages including diving courses for the novice and experienced divers, snorkelling, shore and boat diving at the Resort's front, and equipment rental. International Animation Team for daily programs and nightly shows at the Roman Amphitheatre, with capacity to seat 500 guests; daily live entertainment in different venues. Baron Kids Club is designed in a safe and secluded area for children with a well-supervised daily entertainment program, ensuring around-the-clock activities with specific timings per age group and breaks for meals. The facilities will be managed by trained associates.